Recently during IBM Think 2018, the company's flagship conference, IBM unveiled what it claims is the world's smallest computer.The finished computer is smaller than a grain of salt.First of all let me tell you this tiny device is not for PC or smartphone.It has got some specific applications. How much computing power tiny chip is embedded with? It has the same computing power as Intel’s X86 chip from the 90s.It contains around million transistors.You may be wondering what we are going to do with such a small computing power.There comes the blockchain. 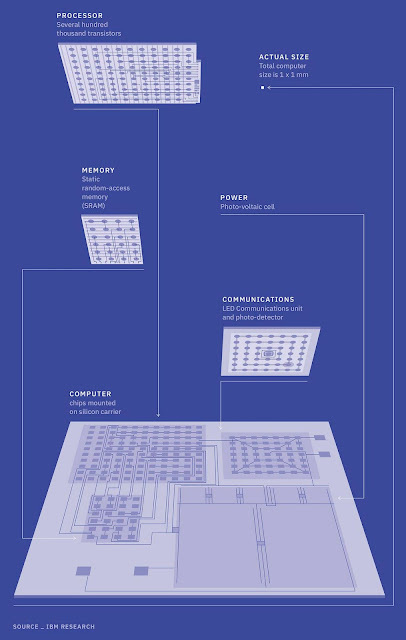 IBM’s new computer, contains up to 1 million transistors, along with a small amount of static random access memory(RAM), a light-emitting diode (LED) and photo-detector that allow it to communicate, and an integrated photovoltaic(Solar cell) cell for power. The computer will cost less than 0.10$ to manufacture.On mass production it will reduce further. According to the company, the device will be a data source for anti-fraud blockchain applications. Block chain is nothing but distributed decentralized database/Ledger that is nearly impossible to tamper.Blockchain became popular with bitcoin and cryptocurrencies. Specifically, this computer will be a data source for blockchain applications. It's intended to help track the shipment of goods and detect theft, fraud, and non-compliance.It can also do basic AI tasks, such as sorting the data it's given. 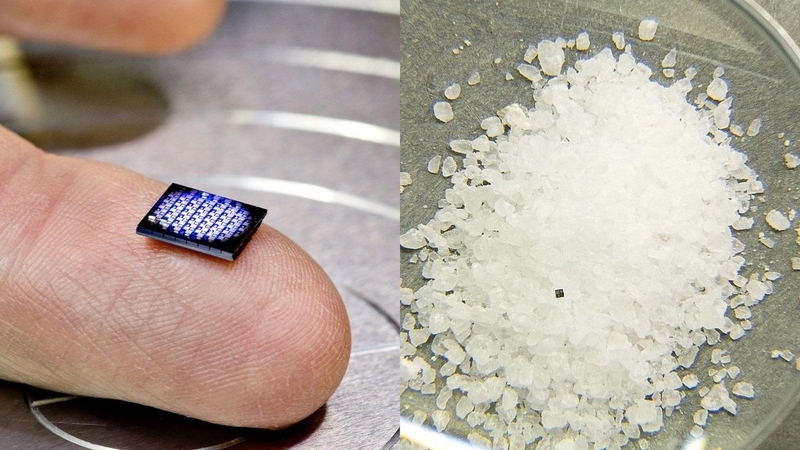 "Within the next five years, cryptographic anchors — such as ink dots or tiny computers smaller than a grain of salt — will be embedded in everyday objects and devices. They’ll be used in tandem with blockchain’s distributed ledger technology to ensure an object’s authenticity from its point of origin to when it reaches the hands of the customer. These technologies pave the way for new solutions that tackle food safety, authenticity of manufactured components, genetically modified products, identification of counterfeit objects and provenance of luxury goods".says IBM head of research Arvind Krishna.